Closing libraries is short-sighted and irresponsible and that public libraries are an essential part of a functioning literate nation. Closing libraries in a time of austerity is like closing hospitals in a time of plague. In the last Public sector spending round, the Tory government pushed through cuts of £6.1 billion and are looking to go even further: Local authorities are now struggling to deliver statutory services or even stay afloat. The overall budget of many authorities has already fallen by as much as a third. Lambeth Council have announced that they want to make 1,000 staff redundant over the next two years and £100 million cuts. Its time Labour Councils stood up to Tory austerity. 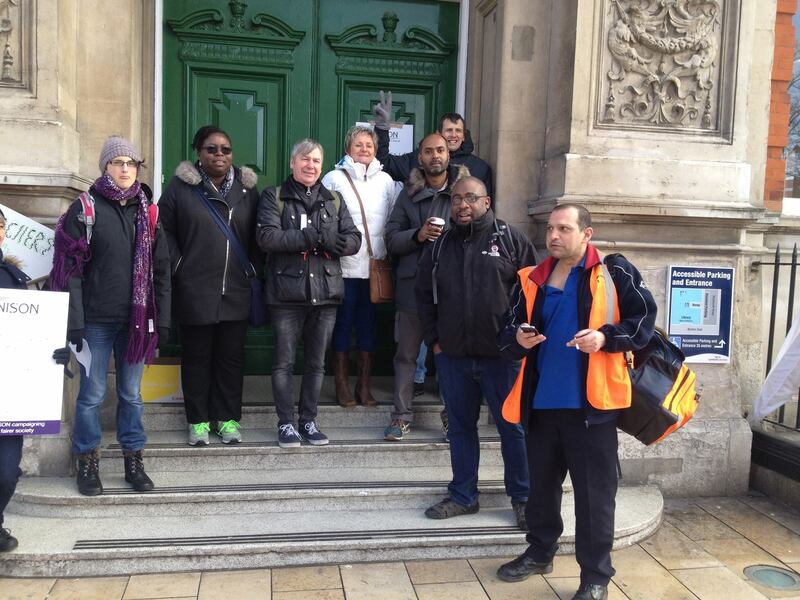 On 1st April 2016, contrary to the desires expressed in a consultation to keep libraries open, Lambeth Council will hand over three of their Libraries to Greenwich Leisure Ltd (GLL) to turn into gyms (these are big public assets which are being given away to GLL on 25 year ‘peppercorn’ rents); sell off Waterloo Library and hand Upper Norwood Library to a trust to run the building with no staff. 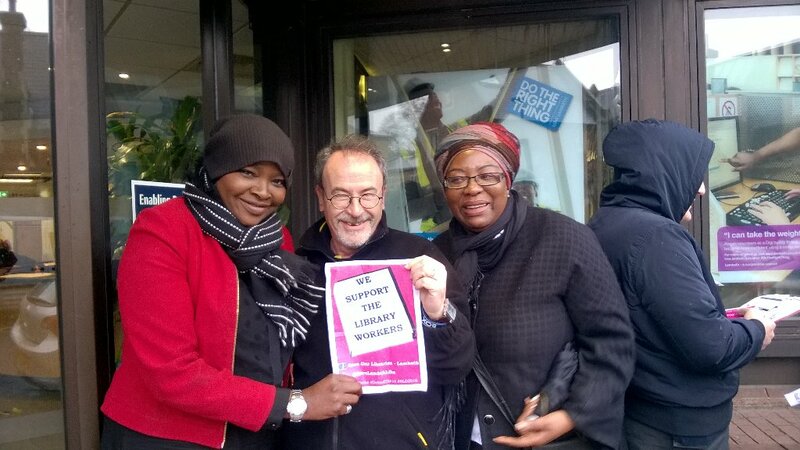 Unison, the Friends of Lambeth Libraries and the Save Libraries campaign have organised supporters to oppose the Council’s plans and have lobbied, taken strike action and demonstrated at levels unseen in recent years. 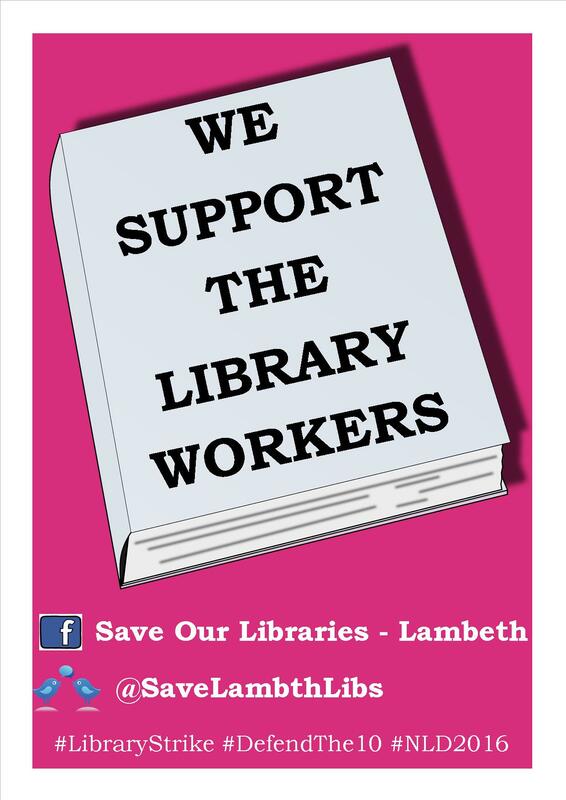 Support the campaign in Lambeth to defend the libraries including supporting community occupations and staff strike action. 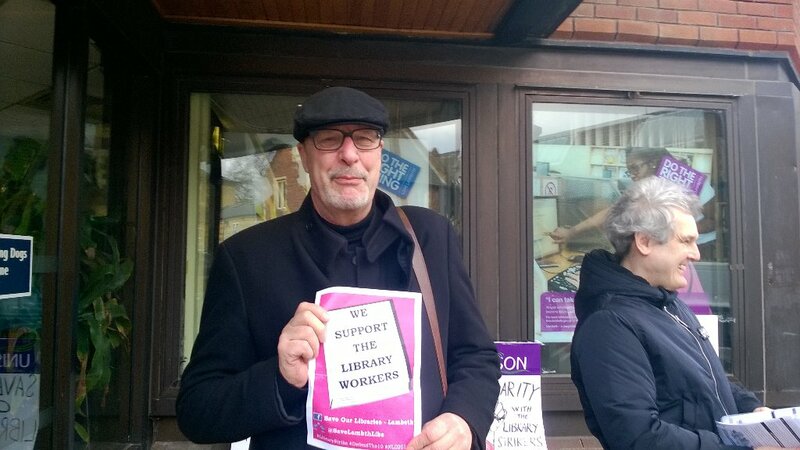 Give support, including a donation £…………………, to the Lambeth Unison members in Libraries to help them to continue their industrial action and to fight back against the Councils cuts. 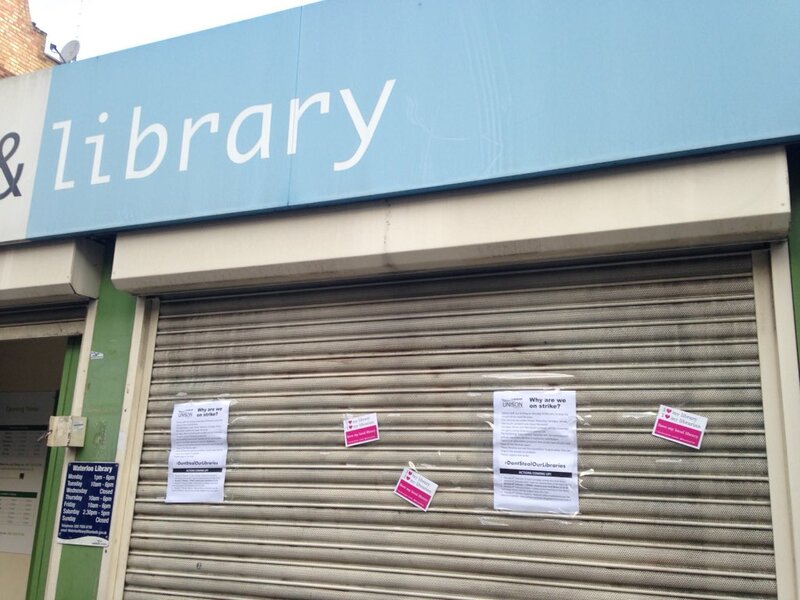 Encourage members to sign the petition at https://www.change.org/p/london-borough-of-lambeth-don-t-steal-our-libraries. Raise within our unions and labour Parties the call for London-wide and nation-wide action, including demonstrations, publicity and industrial action, to stop the massacre of national Library services currently underway. 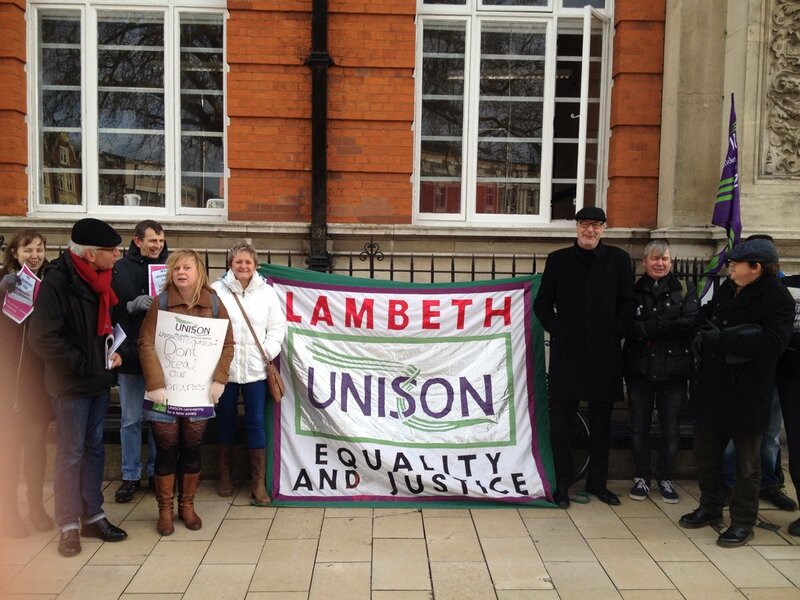 Donations payable to Lambeth Unison: C/o Unison, 1st floor, International House, Canterbury Crescent. London. SW9 7QE. 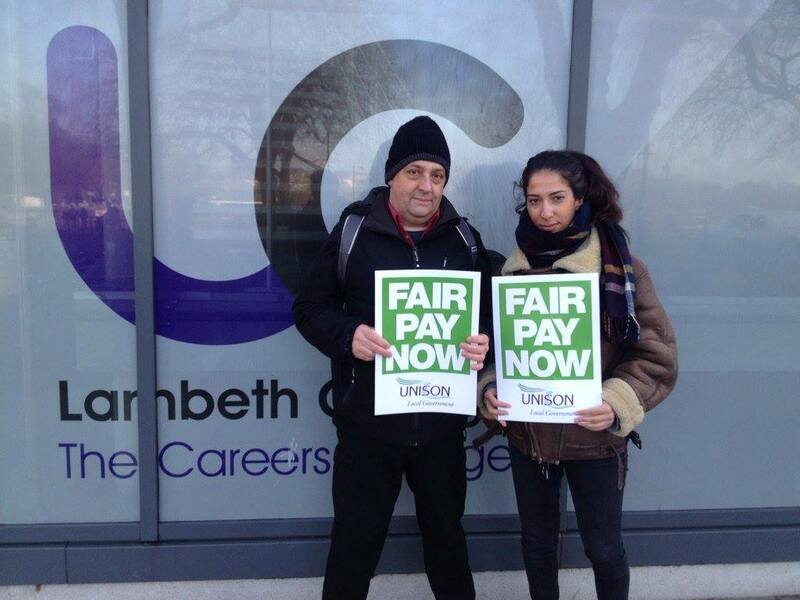 The strike for fair pay in FE on 24 February was the first joint UNISON and UCU pay strike in over 10 years. Members are furious about the Association of Colleges insulting 0% pay ‘offer’ and we made our opposition felt at colleges across the country. Since 2010, funding has been cut by 27%. The squeeze on pay has meant that workers in FE have experienced a 17% real-terms reduction in wages over the last 5 years, equivalent to a £3,000 pay cut for some. Courses and jobs have been cut and workloads have increased. The steady loss of staff due to job cuts, overwork and low pay only adds to the harm being done to the sector and to society. Meanwhile, college Principals have been getting big pay rises—up to £200,000 or more a year. At Lambeth College, the Principal’s pay rose by £17,000 to £149,000 in 2013 and by a further £5,000 to £154,000 in 2014. At the same time, we get a pay freeze and some of our members, not even the Living Wage. 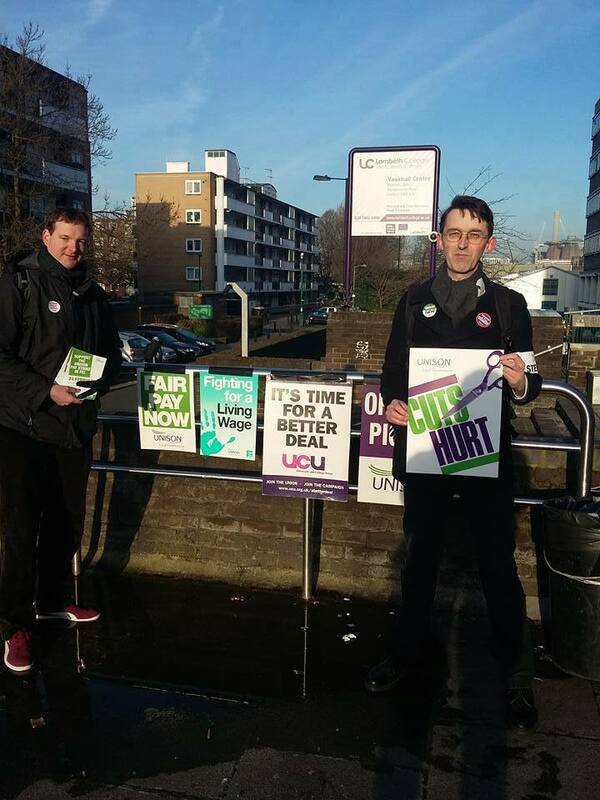 The joint UNISON and UCU picket lines were solid at all college centres. Strikers then went up to a rally in Central London. In her speech, Sally Hunt congratulated strikers and paved the way for further action: “If we have to do this again, then we do. Every step of the way challenge AoC’s policy. We should be very proud”. Gorden Marsden showed Labour support for our strike, for our vision of education and our concerns about the upcoming area reviews. There was a lot of coverage of the strike on social media with colleges across the country from Manchester to Birmingham and from Bristol to Southport. Well done to everyone. UNISON’s National FE and 6th Form Committee are meeting on Friday 4th March to discuss next steps in the campaign for a fair £1 an hour extra for all staff. 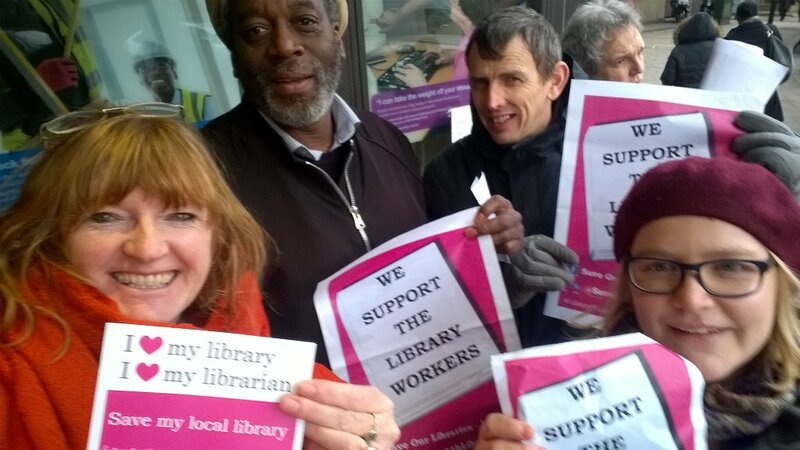 Consultative ballot: take action to defend libraries and defend your jobs! 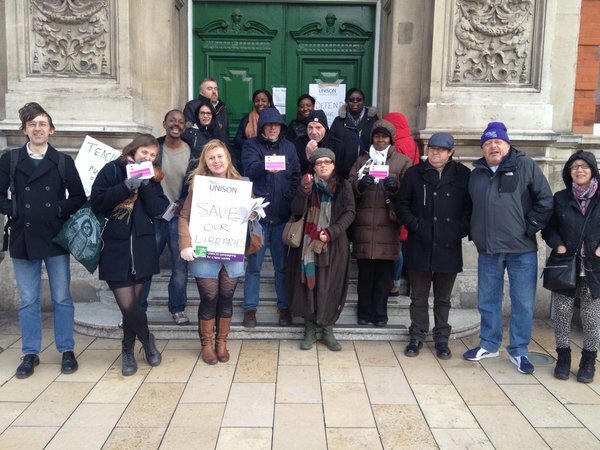 Lambeth Unison Branch Committee has agreed to hold a consultative ballot of all UNISON members employed by the London Borough of Lambeth to ask you if you would be willing to take strike action as part of our current dispute over the Council’s plans for Libraries. 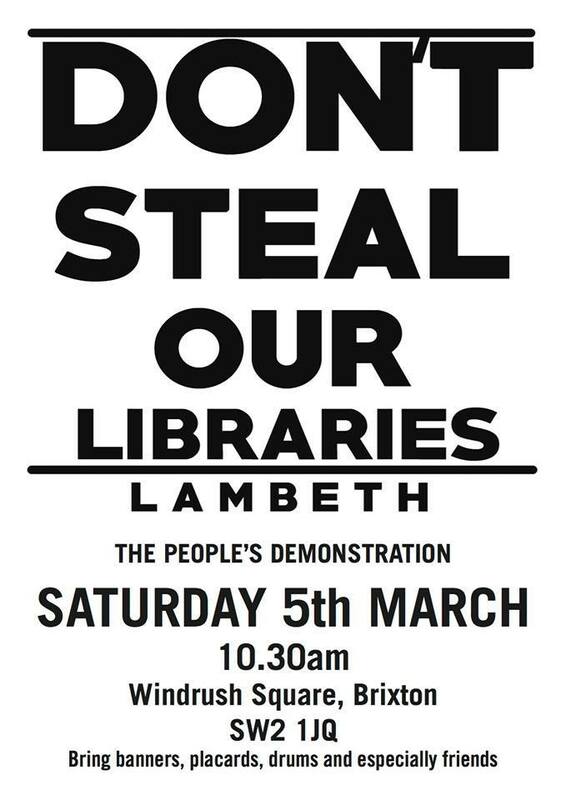 On the 1st April Lambeth Council plans to padlock the doors of five of our libraries. We love Lambeth libraries – which in the last 12 months have become one of the most improved libraries in the country. This is testimony to the hard work of the library staff, many working knowing that the council’s axe is hanging over their jobs and workplaces. There is an alternative proposal in front of the council that will save jobs and keep all the libraries open. The council aren’t listening to what the people of Lambeth want. This protest is a really important as we open up a month of action against their plans. Please come along to Windrush square in Brixton on 5 March at 10.30am – bring home made banners, whistles, your favourite books and friends. The Facebook event is online here. 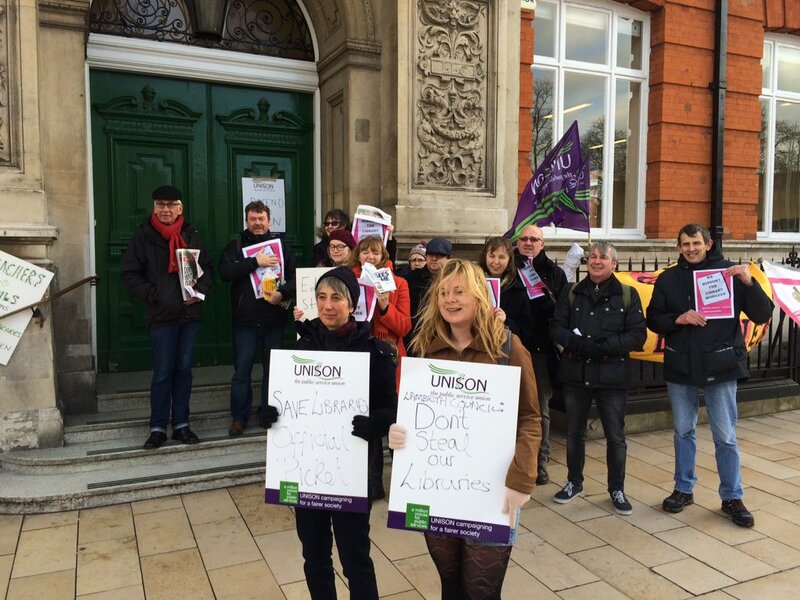 All libraries were closed today by Lambeth Unison members taking strike action to stop the decommissioning of five libraries in the borough. Thank you to the Lambeth College staff Unison members, NUT, UCU, Unite, GMB, RMT and ASLEF members and members of the public who came down to the picket lines to show such solidarity. We all want to keep the library service open so it can serve the people of Lambeth. Our fight is your fight ! 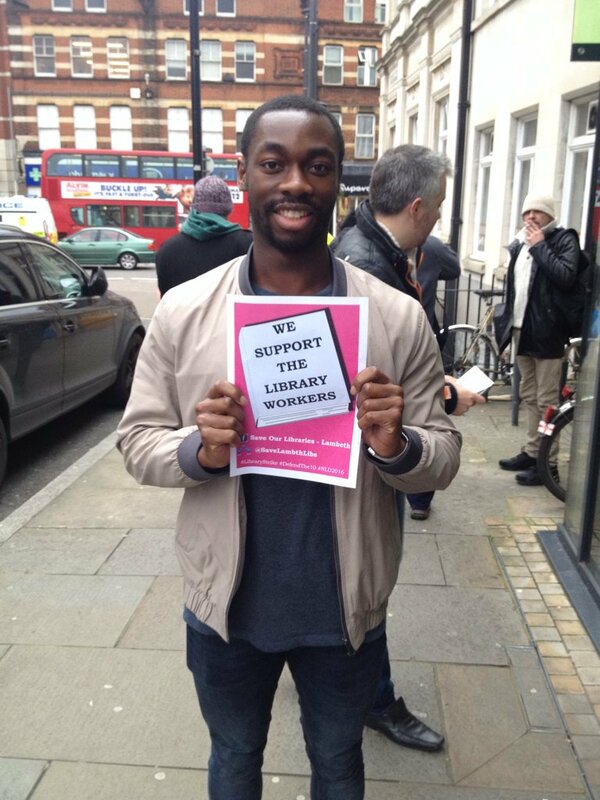 We support the library workers!